Tonight the Sudbury Wolves face the Barrie Colts at the Barrie Molson Centre for the 4th of 8 meetings this regular season. Sudbury has won the first three games, outscoring Barrie 10-8. The last meeting saw the Wolves win 4-1 on October 29th here in Barrie. Christian Propp got the start for Barrie and made 24 saves on 27 shots faced. Rookie, Tom Hedberg got the lone goal for the Colts. Barrie got 35 shots on goal but were not able to score on 5 power play opportunities. Zack Bowman was solid in net for the Wolves and earned the first star of the game making 34 saves. Sudbury has been off to a solid start to the season but have dropped out of top spot in the Central Division having lost their last 3 games straight. Their 3-7-0-0 record over the last 10 games has been a sign of the team struggling to maintain the momentum they came out with to start the regular season. They lost their last game this past Sunday 4-2 in Oshawa against the Generals. They were mostly dominated in the game being out shot 46-26. They got into penalty trouble but managed to allow only 1 goal on 5 penalty kills. They also scored one of their goals on the PP, going 1 for 2 with the man advantage. Jake McGrath was outstanding for the team in net but the team was not able to help him out too much. Macauley Carson had a great game for the Wolves scoring both goals on 4 shots. He also took the majority of the draws for Sudbury going 8 for 19 in the faceoff circle. A win tonight not only could help swing momentum for a team who has been slowly dropping off from a strong start but could also help them work towards climbing back to the top spot in the division. Barrie has lost the last 6 games straight and has only managed to get 2 wins in the last 10 games. North Bay extended the teams losing streak this past Saturday with a 5-2 win at BMC. Ovsjannikov got the start for the Colts and made 33 saves on 37 shots faced. Lucas Chiodo and Jason Willms scored the goals for Barrie. Colts struggled in the faceoff circle but Giordano Finoro was the only player on the team to end the night with a winning percentage on draws going 12 for 21. Matt Brassard had a strong night for the team with a +1 and got 9 shots on goal. That makes up for almost a quarter of the teams shots. Brassard has been doing this all season. Over 19 games he has 68 shots on goal. The only Colt with more is Anthony Stefano with 72. 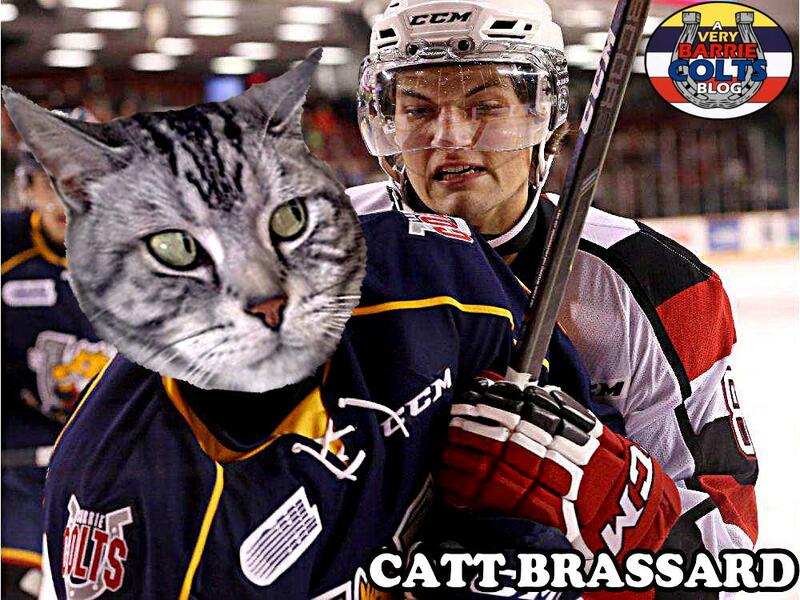 Over 19 games played, @Matt_Brassard9 has 68 shots on goal for the @OHLBarrieColts. Barrie has struggled this season but especially at home. With that, and their troubles containing the Wolves, they will need to have a strong game if they hope to get back in the win column. Barrie has only won 2 of 8 games at home this season. Keys to Success: Sudbury has been taking some not so great penalties and have averaged 16.6 penalty minutes over their 20 games played. Matt Brassard will be a guy to look at to step up on the PP as he currently leads the team with 2 goals and 5 assists with the man advantage. They will also look to him to get pucks towards the net. Barrie will want to do a better job of getting in front of the goal and making the screen. Face offs will also be a huge factor if the Colts hope to generate scoring chances and setting up plays. They will need to have a strong game because the Wolves no doubt will come out strong hoping to end their losing streak as well. Players to Watch: Have been hot on Brassard lately. He has been really doing a great job of making opportunities for the team. Only area I would look for improvement would be discipline. His 27 penalty minutes this season is the second most on the team. He could be a deciding factor in the possibility of us being able to use our "Crying Wolf" GIF again..